Père Lachaise cemetery, in the 20th arrondisement in Paris, is like a peaceful, tree-shaded, 110-acre park, only with lots of bones entombed and underground—not at all gloomy, in my opinion. Tourists love it. A map, available at the entrance, shows where some of the famous names are, but frankly, I find it confusing and prefer to just wander the walkways and possibly happen upon one I recognize. Oscar Wilde, maybe, whose tomb is fenced so you can’t leave lipstick kisses as people used to do. 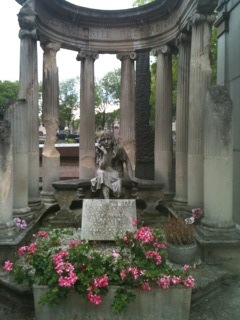 Sarah Bernhardt, Gertrude Stein, Edith Piaf, Chopin, Jim Morrison and thousands more are buried here. Some memorials are haunting: a wall dedicated to the Communards killed in 1871, sculptures in honor of WWII Resistance fighters and Holocaust victims. The hillside cemetery’s name comes from a priest, Père Francois de la Chaise, 17th century confessor to King Louis XIV. In 1804, Napoleon declared the site where the priest once lived a graveyard. Parisians didn’t like it. They weren’t going to bury loved ones so far from the city and in unblessed ground. The answer was to bring in celebrities, starting with the remains of the beloved writer and comedic actor Molière and the author La Fontaine. A few years and several bodies later, the place was in demand. 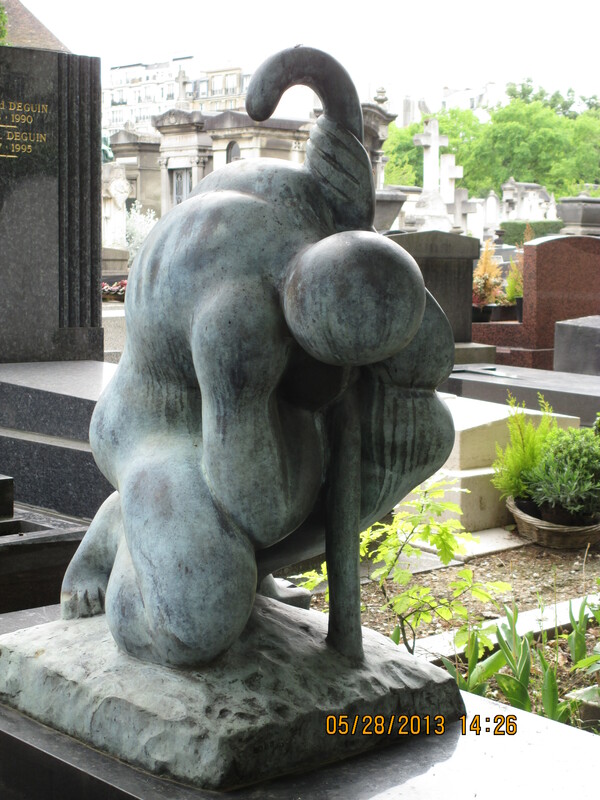 Today Père Lachaise holds more than a million of the dead, and there’s a long waiting list. Montparnasse Cemetery, on the other side of the city in the 14th arrondisement, is much smaller. Its flat, 47 acres are divided into the petit and the grand, with some 1200 trees making it another quiet park. 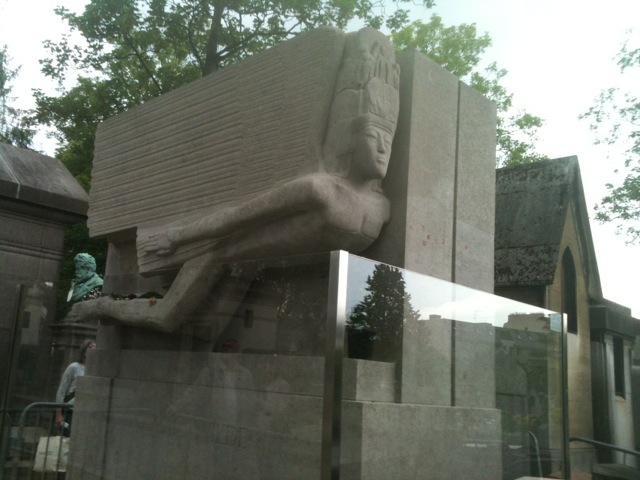 Montparnasse holds the remains of many artists and intellectuals, plus memorials to Paris police and firefighters who died in the line of duty. Jean-Paul Sartre, Simone de Beauvoir, Alfred Dreyfus, Susan Sontag, and Paul Belmondo are among the more famous names on the graves. I’m intrigued by all of it – the sad little verses, the ceramic flowers, the names known only to long-gone family members. One monument is a huge bed with sculptures of Monsieur and Madame Pigeon reclining on it, and an angel standing guard above. Pigeon helped found La Samaritaine department store and invented a type of gas lamp that wouldn’t explode. This was hugely important in the 19th century and made him wealthy. He designed the tomb to hold his family of 18 people. After all this reflecting on mortality, I’m in need of an apéritif at a lively (emphasis on live) sidewalk café, so I’m heading for La Rotonde, on Boulevard Montparnasse. Hemingway and Picasso liked it and I do too.